The vertical drop from summit to base is 5581 ft. The average difference in altitude between base and summit of Ski Resorts in Austria is 2388 ft. Most runs are therefore relatively long. The high point of the ski resort is located at an elevation of 8599 ft. Season starts on Dec 8 and ends on Apr 22 (135 days). Average season duration in Austria is 114 days. Average snow depth during the season (Dec 8 to Apr 22) is 36 " at summit elevation and 19 " at base elevation. Snow coverage is usually best during February, offering an average snow depth of 46 " at summit elevation and 26 " at the base. Grossglockner Resort Kals Matrei features 61 sunny days on average per season. 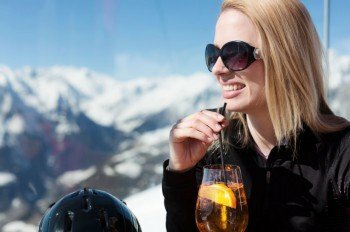 The average for all ski Resorts in Austria is 61 sunny days. February is the sunniest month with an average of 21 sunny days. The Großglockner Resort is a family-friendly ski area in Tyrol with 37 kilometres of runs. The resort is well worth a visit for the breath-taking panoramic views alone – you can marvel at no less than sixty peaks measuring over 3,000 metres! The entry points to the ski area are Kals and Matrei. However, if you are keen to ski on the Großglockner then Kals is probably the best option. 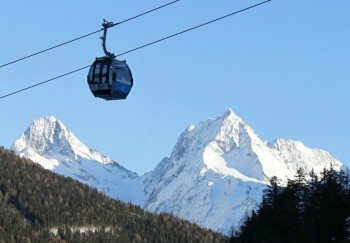 The Figollift and Blauspitzlift take skiers up to the Blauspitze (2575 m), the closest peak to Austria’s highest mountain (3798 m). This part of the ski area is particularly attractive for advanced skiers, and trail no. 17 stands out thanks to its varied terrain. This trail has both a red and black-marked route. There are also several practice lifts for beginners in Kals, making it an ideal base for taking your first steps in the world of winter sports. In addition, the Matrei side of the resort features a whole host of blue-marked runs (most notably nos. 2 and 10) which are suitable for all the family. There is also a children’s area with magic carpet lifts and a heated recreation room at the mountain station of the Landen I lift. Advanced skiers will enjoy the varied terrain offered by the groomers down from the Cimaross, Happeck and Goldried lifts, with the two black-marked trails down from the Cimaross Lift firm favourites among experts. There are some 13 lodges and mountain restaurants dotted across the ski area. Two of the most popular are the Figolalm and Bergrestaurant Glocknerblick. The strikingly modern Bergrestaurant Blauspitz also offers tasty fare and stunning views. Meanwhile, the Adler Lounge is the ski area’s highest restaurant holding a Haube culinary seal of quality. The valley runs down to Kals and Matrei are a must if conditions are good. Advanced skiers should definitely also check out the black-marked run no. 17. In addition to fun on the slopes, the beautiful landscape in Eastern Tyrol is ideal for long winter walks. There are some excellent paths in the area, such as on the Glocknerstraße from Kals via the Ködnitz Valley to the Lucknerhaus or along the Kalserbach to Lana and Pradell. The region’s sled runs are also firm favourites with families. And if you don’t mind walking up to the starting point on foot, the 3.9-kilometre Bodenalm sled run is well worth a visit. From Munich, you can drive to Matrei via Kufstein (A8/A12), St. Johann/Tirol and the Felbertauernstraße. To reach Kals, you have to turn off in Huben. By train, you should change in Salzburg and Spittal or Innsbruck for Lienz. From there, the Postbus service runs regular buses to Kals am Großglockner.